Late yesterday I attended most of a briefing by Fair Pensions on their campaign to get a Living Wage for all employees and subcontractors of the FTSE 100. Check out my twitter feed for 5 November for some of the stuff I found interesting. Some key points from seminar: Fair Pensions CEO Catherine Howarth, that they had some form of contact with 50% of FTSE 100 companies and 11% are or will be Living Wage employers. While Rhys Morgan, the Director of the Living Wage Foundation said that 80% of employers who pay a living wage found that quality of work was improved. I was glad that he also quoted Labour Leader Ed Miliband as saying that a Living wage was "important but not the summit of our ambitions". UNISON argues for a Living Wage "plus" - not just £8.30 per hour (as welcome as it is) but also decent sickness pay, pensions, annual leave as well as trade union recognition and collective bargaining. I had to leave early for a Pension committee meeting. 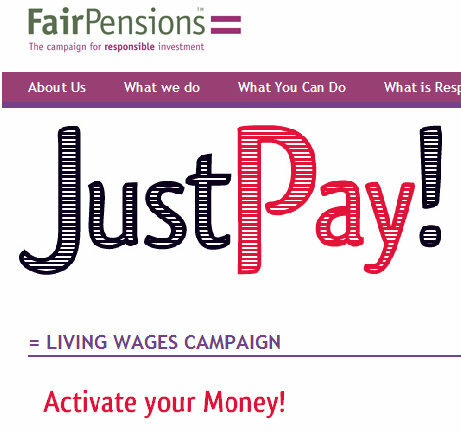 It is also rather ironic that during the "Living Wage week" that UNISON is running a campaign against Metropolitan Housing Association, which claims to be a charity and responsible employer. Yet it paid £412,000 to get rid of its former CEO, while at the same time planning to pay its care workers less than a living wage and employ part time staff on poverty rates, so their their wages will be topped up by the taxpayer. How completely disgusting and shameful. If you work for Metropolitan or want to show solidarity sign the Petition here and read the comments by staff who in 2012 face being forced below the poverty line not above.